The combination of cold weather and loneliness could be lethal in the coming months, England's most senior nurse is warning. Prof Jane Cummings, NHS England's chief nursing officer, said cases of strokes and heart attacks tended to rise after a cold snap. She said that, and the growing problem of loneliness, were a dangerous combination over winter. This could include visiting elderly friends, family and neighbours more regularly, doing the shopping for them or picking up prescription medicines, Prof Cummings added. "We can all take steps to alleviate loneliness by looking out for family, friends and neighbours." The issue is being highlighted as part of the NHS Stay Well this Winter campaign. It comes amid growing evidence of the impact of loneliness. 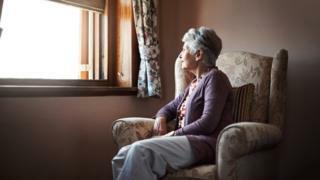 Half of people aged 75 and over live alone - about 2 million people across England - with many saying they can go days, even weeks with no social interaction at all. The Campaign to End Loneliness estimates one in 10 older people is chronically lonely. But Prof Cummings said people of all ages can be affected. A third of new mums claim to be lonely, while eight in 10 carers say they feel isolated. "Loneliness has a devastating and life-threatening impact on people of all ages. For vulnerable groups, social isolation combined with the health dangers of colder weather is a lethal combination." Research shows being lonely and isolated is linked to increasing the risk of early death by a third. Labour MP Rachel Reeves, co-chair of the Jo Cox Loneliness Commission, said: "Loneliness is no longer just a personal misfortune but has grown into a social epidemic. "If we can tackle it effectively we can make Britain not just a happier but also a healthier country in which to live.